Thanks to the Daily Mail Investigations Unit, hard evidence has been obtained of the underhand tactics deployed by the BBC’s TV Licensing gestapo, Capita. This was nothing short of a scoop which saw a Mail journalist pose as a prospective interview candidate for “TV Licence inspector”. The interview was with Ian Doyle, Capita’s area manager for TV Licensing. The interview was secretly recorded and its revelations will be far reaching for the BBC. In the secret video, Doyle explains the justification for driving TV Licence inspectors hard was because ‘we’re greedy’. Doyle goes on to explain the TV Licence inspector role is target driven which requires that they must ‘nick’ 28 people a week for TV Licence ‘evasion’ and get 28 conviction statements to count as a ‘sale’. Failure to do so, Doyle explained, would mean that ‘questions will be asked’. Above the 28, bonus payments would be made… The problem here is obvious: the target and commission system creates a pressure on people to cut corners in their ‘evidence’ gathering. There is ample evidence these commission driven TV Licence salesmen have indeed cut corners on numerous occasions signing people up to licences they don’t need or just plain making up ‘evidence’. Already the Capita CEO has resigned following some dubious profitability figures for Capita and no doubt partly as the fall guy for the Mail story. Article here. The BBC was so disappointed with Capita in the past, they renewed their TV Licence contract in 2016 until 2022. (City AM: Capita awarded contract extension) The BBC is completely complicit in the TV Licence scam, but they want to pretend the grubby business of squeezing people for the £147 a year ‘fee’ doesn’t exist in all its gory and despicable detail. ‘I didn’t know’ from top BBC brass just doesn’t cut the mustard anymore. If anyone is so naive to think another contractor would run the TV Licensing operation any differently they should think again. 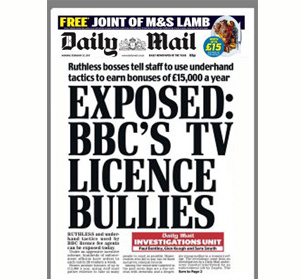 The TV Licensing system has ALWAYS relied on threats and intimidation of the public. 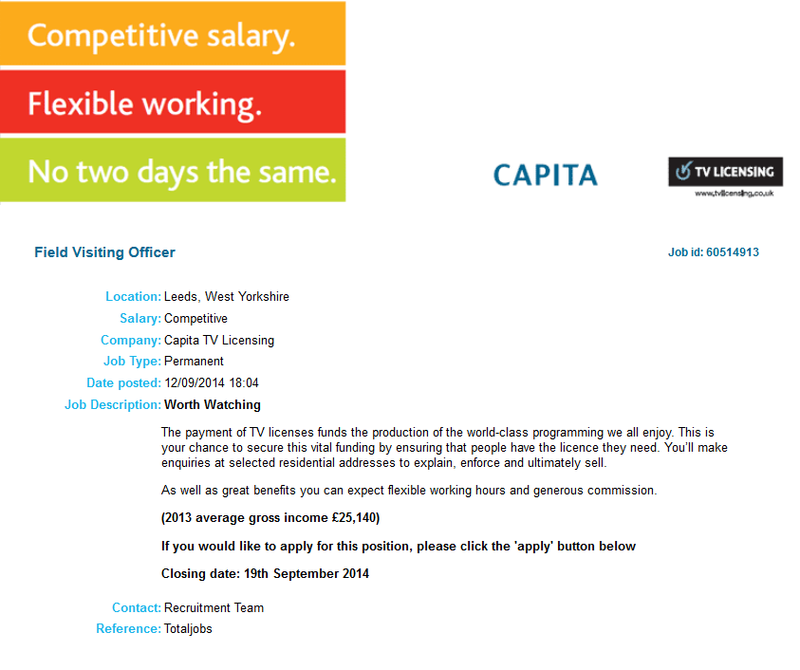 Sales operation: Capita advertisement for a Capita Field Visiting Officer. ‘…and ultimately sell’. The most damaging secret video was in Part 2 where the underhanded tactics are exposed by Doyle openly. The most pertinent is “You’ll get all you need for a conviction statement within the first 40 secs of the conversation”. This is the most important aspect that is revealed in the videos. Having any form of contact with the Capita BBC goons and you risk giving them information that could wind you up in court on a speculative prosecution. Always say nothing. If you opened the door by mistake, say nothing and close the door. This video lays bare that there is nothing they can do with zero information. They know it and we know it. Now with the price ratcheting up for the TV Licence under inflation, £147 from April 2017, more people will be questioning why they are paying. With government intransigence to abolishing or decriminalising the BBC TV Licence, we must abolish it ourselves. It is your moral duty now to resist paying the BBC TV Licence. You can still do so 100% legally: Do not watch live TV or the BBC iPlayer and have zero contact with the BBC Capita TV Licensing bullies. It really is that simple. Capita are the scum of the earth. Last one I dealt with got thrown across the communal hallway after trying to get past me into the property. I am nearly 60 and disabled, maybe he thought easy target. I don’t let anyone in without an appointment. If they turn up with a warrant I will ask for a copy of the reasons given to the magistrate to obtain the warrant signed by the magistrate and the Crapita scum. If they cannot, or won’t produce the list of reasons then warrant or not they won’t get in.